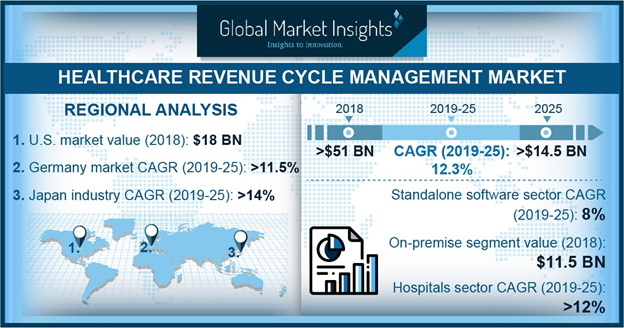 Healthcare revenue cycle management market size was valued at USD 47 billion in 2017 and is expected to witness 11.8% CAGR from 2018 to 2024. Increasing healthcare expenditure in developed as well as developing countries will positively influence the healthcare revenue cycle management (HRCM) industry growth during the forecast period. Growing prevalence of chronic diseases will elevate the number of hospital admissions and contribute significantly to healthcare expenditure. High awareness in developed economies regarding diagnosis and treatment of various diseases will surge healthcare expenditures. Furthermore, technologically upgraded software and platforms are utilized by the hospitals, healthcare service providers as well as the medical policy providers such as Medicare and Medicaid to analyze and process the patient data. Availability of integrated and standalone revenue cycle management solutions that enable efficient management of healthcare revenues will foster business growth in foreseeable future. Growing demand for health insurance in the developed region will augment healthcare revenue cycle management industry growth over the forthcoming years. Medicare and Medicaid policy providers implement various initiatives that assure affordable healthcare services and facilities resulting in increasing demand for insurance policies. Availability of such policies prove beneficial for the geriatric population with comparatively low-income level as well as overall population to get access to advanced healthcare services. Such processes are carried out for a large population and require efficient and accurate data management. Increasing demand for integrated software for data management will stimulate the industry growth in upcoming years. However, frequent changes in healthcare regulatory compliance and dearth of skilled professionals may hamper healthcare revenue cycle management business growth over the forthcoming years. Integrated healthcare revenue cycle management segment dominated the overall market with more than 85% revenue share in 2017. The growth is attributed to increasing shift in the healthcare business from volume-based payment to value-based systems that has surged the adoption of these systems in recent years. Moreover, majority of physicians prefer integrated software in order to cope with declining productivity and reducing reimbursements, thereby propelling industry growth. In addition, growing interest of buyers in integrated revenue cycle management solutions comprising of electronic health records, medical billing, and patient scheduling applications will further accelerate business growth. Standalone healthcare revenue cycle management segment accounted for considerable revenue in 2017 and is estimated to witness lucrative 8.2% CAGR during the forecast timeline. Use of numerous standalone software databases and applications through a multifaceted network of home-grown interfaces, legacy and manual processes will favor industry growth. However, lack standard data models in standalone systems, for sharing health information between providers, users and patients may hamper the segment growth in the foreseeable future. Claims & denial management segment held largest revenue of USD 13.9 billion in 2017 and is estimated to witness robust growth in the foreseeable future. Denial management is a critical element to an effective revenue cycle management and a healthy cash flow. Increasing demand for claims and denial management services including AR (Aging Report) follow ups, resolution of denied claims, claims status checks and preparing an appeal letters will further accelerate the segment growth. Medical coding and billing segment accounted for significant revenue share in 2017 and is estimated to show 11.3% CAGR over the forecast timeframe. Segment growth is attributable to growing cases of insurance issues pertaining to misinterpretation of medical documents. High adoption of coding and billing procedures in hospitals will further surge demand for these services thereby stimulating business growth. Cloud-based healthcare revenue cycle management segment dominated the overall industry with more than 75% revenue share in 2017 and is projected to show lucrative CAGR over the analysis timeframe. Cloud-based arrangements are usually more affordable as compared to the on premise systems, and enable organizations to minimize IT equipment costs. Growing demand for enhanced consumer platforms at moderate expenses will drive the segment growth. On premise healthcare revenue cycle management segment held USD 11.1 billion in 2017 and is estimated to show considerable growth over the analysis timeline. On premise systems include physical servers and application that are stored on site of client to optimize overall revenue cycle. On premise revenue cycle management solutions offer better security as servers installed on premise can be protected by restricting unauthorized access. Such factors will favor segment growth during the forecast period. Physicians segment held largest revenue of USD 15.7 billion in 2017 and is anticipated to show robust growth in the foreseeable future. High segment growth is attributed to adoption of viable revenue cycle management systems by physicians and physician owned organizations to streamline procedures, improve submission of claims and expand accumulations. Furthermore, billing associations provide fast and smooth delivery of procedures that enable physicians to concentrate around quality patient care delivery. Aforementioned factors will foster segment growth over the forecast period. Hospitals segment accounted for significant revenue in 2017 and is anticipated to witness lucrative CAGR of 11.6% during the forecast timeline. Hospitals are striving to optimize revenue by enhancing management of coding, accounts receivable, claims processing, self-pay collections and insurance follow-ups. Growing demand for revenue cycle management services in hospitals and health systems to increase cash flow and achieve sustainable financial performance will foster the segment growth during the analysis timeline. North America healthcare revenue cycle management market dominated the global market with 40% revenue share in 2017 and is estimated to show similar trend in the coming years. High growth is attributed to significant changes in regulations that have largely affected the finances, organization, and delivery of healthcare services. Moreover, increasing number of hospitalizations in the region will fuel the need for healthcare revenue cycle management systems thereby augmenting the regional growth. 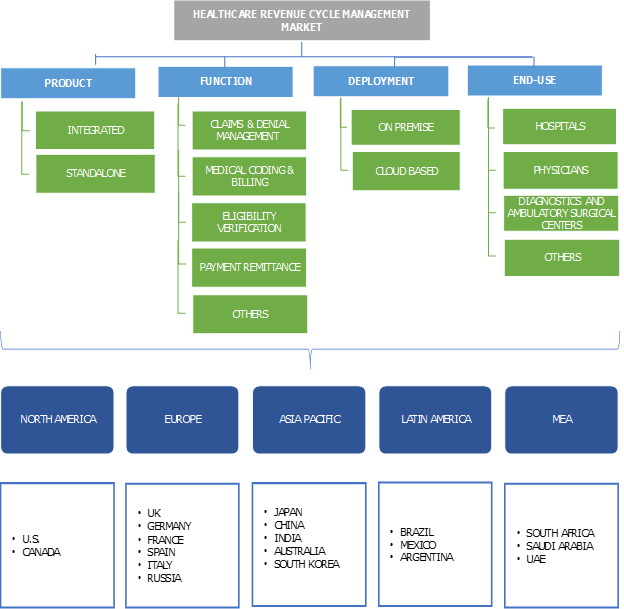 Asia Pacific healthcare revenue cycle management market accounted for considerable revenue in 2017 and is expected to witness highest CAGR of 14.5% over the forecast period. Increasing developments in healthcare facilities, rising pressure on healthcare infrastructure, awareness in healthcare industry regarding information technology, growing expenditure and initiatives undertaken by governments for implementing revenue cycle management solutions will favor regional growth in the coming years. Some of the key industry players operating in the healthcare revenue cycle management market include Allscripts Healthcare Solutions, AGS Health, Athenahealth, Accretive Health, Cerner, CareCloud, Conifer Health Solutions, Emdeon, Etransmedia and Experian. Industry players implement certain strategic initiatives such as merger, new product launch, acquisition and partnerships that help them in strengthening their market position. For instance, in April 2015, CareCloud entered into a partnership with Marshfield Clinic’s IT arm. CareCloud merged its medical billing software and services and Concierge practice management with Marshfield Clinic’s clinical solutions such as electronic health record, population health management tool and patient portal. The strategic partnership enabled company to capitalize on market opportunities and render company with sustainable profits. The concept of healthcare revenue cycle management (HRCM) can be traced back to its use in private and public health systems that have been facing declining margins and revenue pressures for years. The trend in healthcare revenue cycle management is expected to persist as increasing demand, therapeutic and technological advancements and infrastructure upgrades strain the already limited financial resources. Increasing healthcare costs pose a challenge on insurance coverage and affordability in developing economies. Furthermore, alteration in population demographics and rising risk of value-based reimbursement models is surging the need for better estimation and organization of revenue cycles, especially for high and at-risk patient population. As a result, precedence of several physician practices and hospitals offer new growth opportunities to the healthcare revenue cycle management solutions. Most of the organizations are eagerly investing in advanced HRCM capabilities to streamline cost-effective financial performance by paving the way for flawless payer-provider communications regarding financial risk management.